A year after the English riots, Miranda Iossifidis and Philippa Thomas review the means by which scholarship and the media have reacted, disputed and converged in their responses. To what extent have these efforts been productive, and what voices are still to be heard? The kids are revolting. But why? 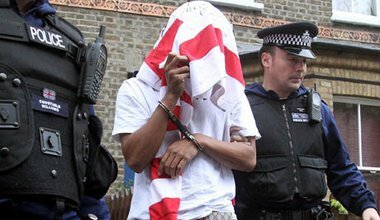 Reflections on the Summer 2011 English Riots one year on: the 'Underclass', welfare retrenchment and workfare regimes. A report of the second trial of UK Uncut activists who occuped the high class grocers Fortnum and Masons in March last year, by a defendant in the first. It too seems certain likely to confirm that in a political case the UK's legal system starts from the verdict and tries to ensure nothing disturbs it, such as, for example, evidence. 'Underclass', 'feral', 'feckless': these terms have gained new currency after England's August riots. Although not explicitly racist, together they form a coded language that casts working class and Black communities as the 'enemies within'. The re-emergence of a certain vocabulary that stigmatizes the working class, benefit seekers, and the black community, is becoming increasingly mainstream in Britain. So why now, and who stands to benefit? Can we rely on the Lib Dems to defend the role of human rights in Britain? David Cameron pledged in the wake of England's riots to address the country's 'rights not responsibilities' culture. Will the Liberal Democrats stand firm against the Prime Minister's hostility to human rights legislation? Social networking has come under fire since England's week of riots and looting. But the same tools that facilitated a rapid escalation of violence also allowed citizens to organize a speedy response. 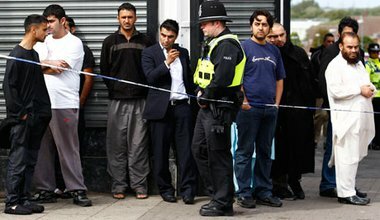 Ten years after 9/11, the 'War on Terror' in Britain is being replaced by a 'War on the Underclass' as exceptional legal powers and the militarization of the police come to constitute the new normal. The riots and their aftermath invoked both shame and pride in England. Many members of the Islamic and other minority faith communities were praised for their bravery and dignity. But will this change the English public's attitude towards Muslims?